Three Thai citizens and one Burmese national were arrested after the discovery of a mass grave. It contained 26 bodies of refugees belonging to the Muslim minority. They were kidnapped by human traffickers, who demanded a ransom for their release. Bangkok promises to clamp down on trafficking. Bangkok (AsiaNews) - The Thai police have arrested four people - three citizens and one of Burmese nationality - suspected of human trafficking targeting Rohingya refugees. 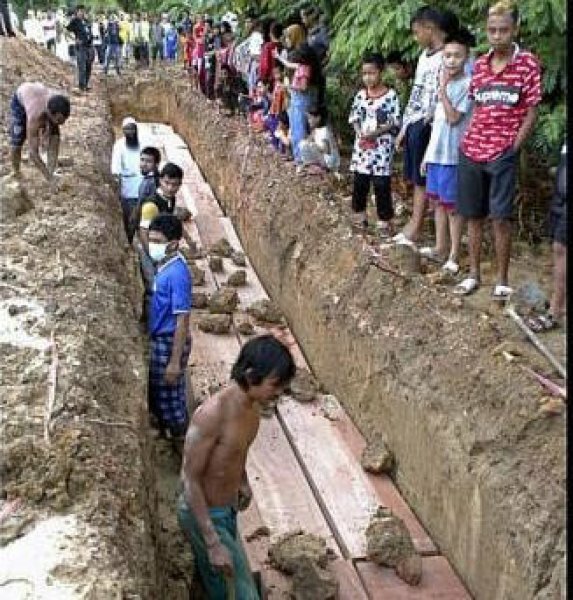 The investigation started following the discovery of a mass grave, containing the corpses of 26 members of the Muslim minority - all men except one - fleeing from Myanmar where their rights are denied and they are often subject to persecution . The site, discovered last week, is located in an abandoned field near the jungle, that is only 400 meters from the border between Thailand and Malaysia. Local sources said that the area is often used by Rohingya who flee from Myanmar, to reach third countries such as Malaysia or Singapore. The victims were migrants, who had been locked up in camps (abusive) by unscrupulous traffickers who extort money from their families before releasing them. The victims would have died due to illness and, in some cases, starvation. Those arrested include local government officials and members of the public administration, who exploited their position to profit from migrants. Among them a member of the provincial council of Songkhla, who was caught in the camp, and two officials of a village (Padang Besar). The police are on the trail of the other eight suspects, also involved in trafficking and detention of Rohingya refugees. Activists and human rights groups have been denouncing a climate of silence, if not connivance of trafficking in human lives, by government officials, administrators and members of the security forces. General Somyos Pumpanmuang, mandated by the Prime Minister Prayut Chan-o-cha, visited the mass grave and the center where Rohingya refugees were detained. He announced thorough investigations and assured that the culprits will be brought to justice. "We have issued arrest warrants for others" adds the senior officer "and the authorities involved in the case have already collected other evidence." He ensures an iron fist against those involved and "local political and administrative officials" who are caught will not be granted favorable treatment. Since June 2012, the western state of Rakhine has witnessed violent clashes between Burmese Buddhists and Rohingya causing at least 200 deaths and 250 thousand displaced people. According to United Nations estimates, there are still 800 thousand members of the Muslim minority in Myanmar, who the government considers illegal immigrants and who are therefore subject to abuse and persecution. To date, there are still 140 thousand displaced persons confined in refugee centers which, as according to the Burmese government must accept the classification of Bengali - and obtain citizenship - or remain in the camps "for life". Within these camps they are deprived of basic rights, such as health care, education or work. The Catholic Church in Burma has intervened on several occasions against the marginalization and neglect faced by the Muslim minority.